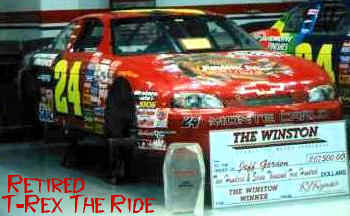 For The Winston, Jeff Unveiled a special Jurassic Park car and a uniform to match to promote "Jurassic Park: The Ride." 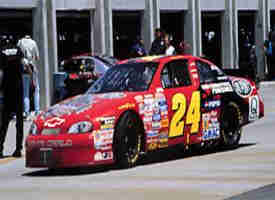 In the afternoon, after he and Ray met by the car, it was clear from practice that he had strong car. But Jeff was too fast on his approach to the pits for the required stop during qualifying. He took the green flag in the 19th and last starting position. The bad starting spot simply gave Jeff the opportunity to display the prehistoric power of his car. He went from 19th to third in the first 30-lap segment. The field was inverted for the second 30 laps, so he restarted 17th. He led the way to the front, cutting a path for the fast cars as he passed competitors high and low. 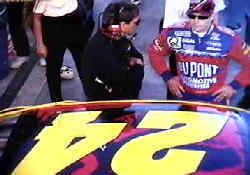 For the final 10-lap sprint, Jeff started fourth on the outside of the second row. 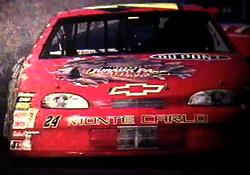 He drove under Bobby Labonte in turn three of the first lap to take second place. 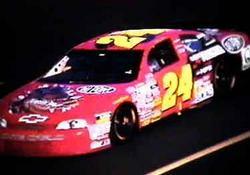 On the next lap, he made the same move in the same place to polish off Terry Labonte, and the race as well. 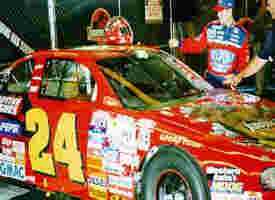 His victory touched off a raucous celebration in VICTORY LANE. 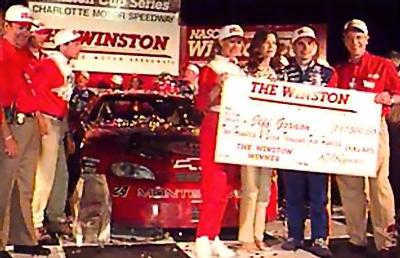 Jeff Gordon dominated the Winston Select at Charlotte Motor Speedway - NASCAR's all-star race. It was all Gordon during all three segments of the Winston Select, and because he won all three segments of the race, he was the winner of a $300,000 prize bonus. The Winston Select was a nonpoints race, but it was still a good feeling for Jeff to finish first and to earn the bonus. 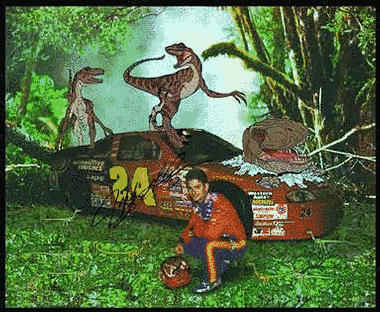 These 2 Pictures Are For Our 7 Year Old Son, Who Loves T-Rex And "Jeff Gordon" "T-REX"The Most Dominating Car In NASCAR History"JURASSIC PARK THE RIDE"